This is the F-14 No. 3 Pre-Production tail fin, currently at the Cradle of Aviation Museum. It was one of 12 pre-production jets. This one was bailed to Grumman for testing. It never landed on a carrier. It is kept at the Calverton Flight Test Facility out on the east end of Long Island. 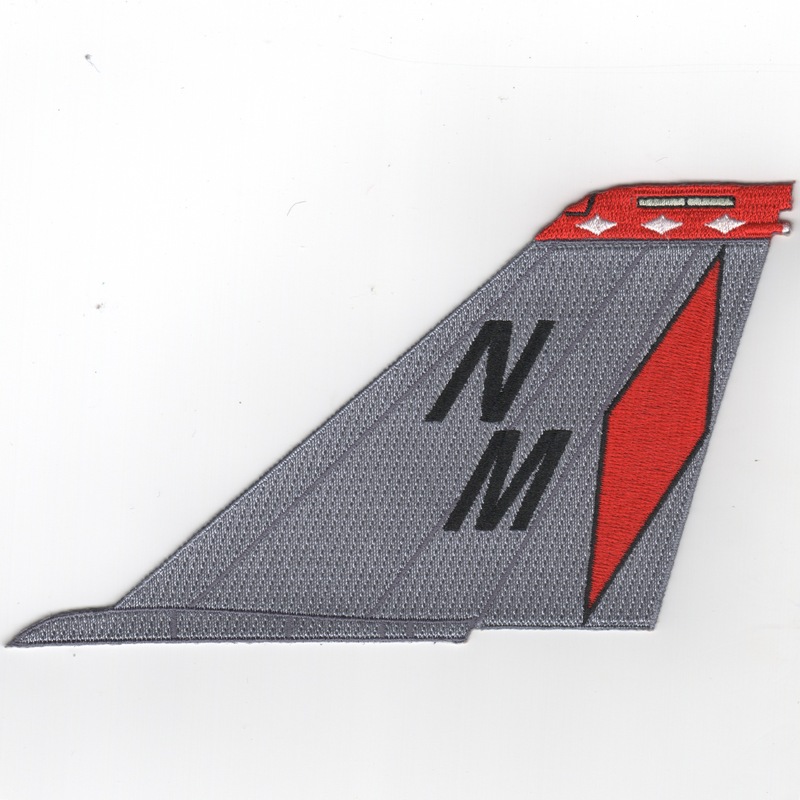 This is the red/gray version of the F-14 Tomcat Tail Fin for VF-1 "Wolfpack". It shows the mascot "wolfhead" on an all-gray backing. This patch does not come with velcro attached (none of them do). 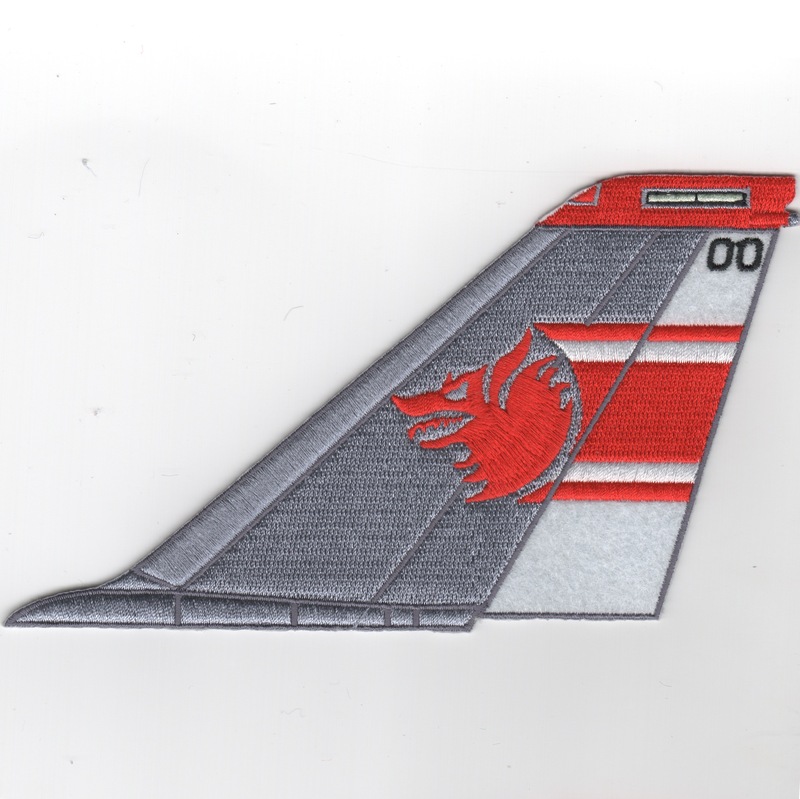 This is the red/gray/white version of the F-14 Tomcat Tail Fin for VF-1 "Wolfpack" and does NOT have the text box at the bottom of the patch. 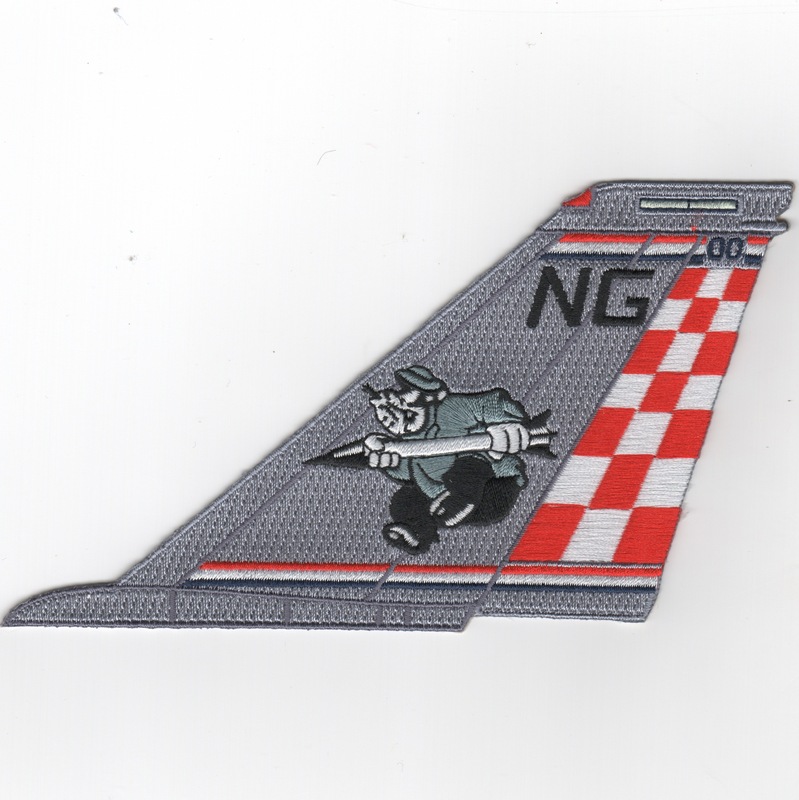 It shows the mascot "wolfhead" on an gray backing with a white felt rudder. This patch does not come with velcro attached (none of them do). 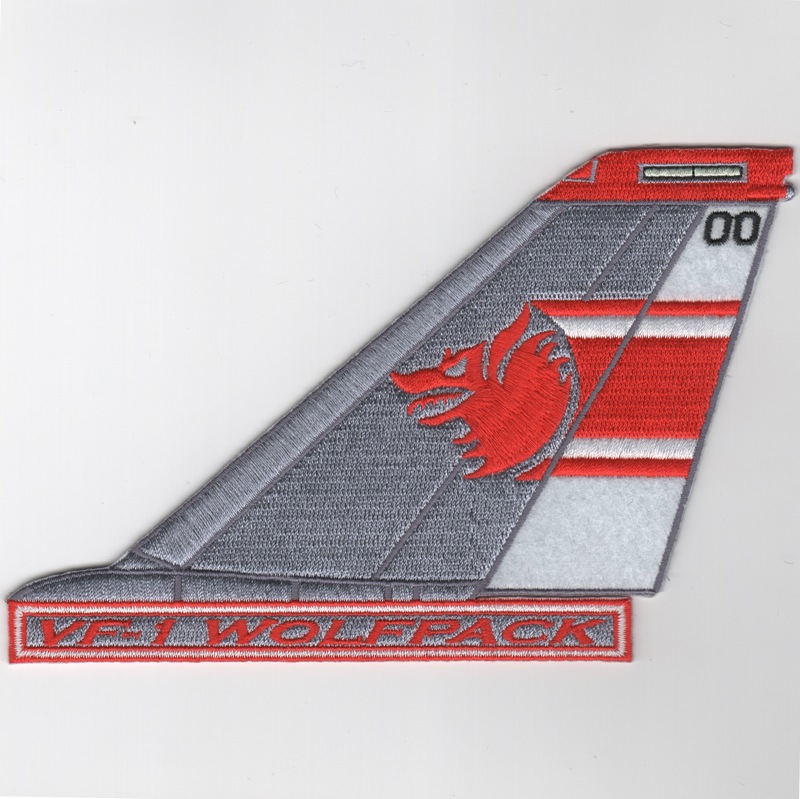 This is the red/gray/white version of the F-14 Tomcat Tail Fin for VF-1 "Wolfpack" and does have the text box at the bottom of the patch. It shows the mascot "wolfhead" on an gray backing with a white felt rudder. This patch does not come with velcro attached (none of them do). 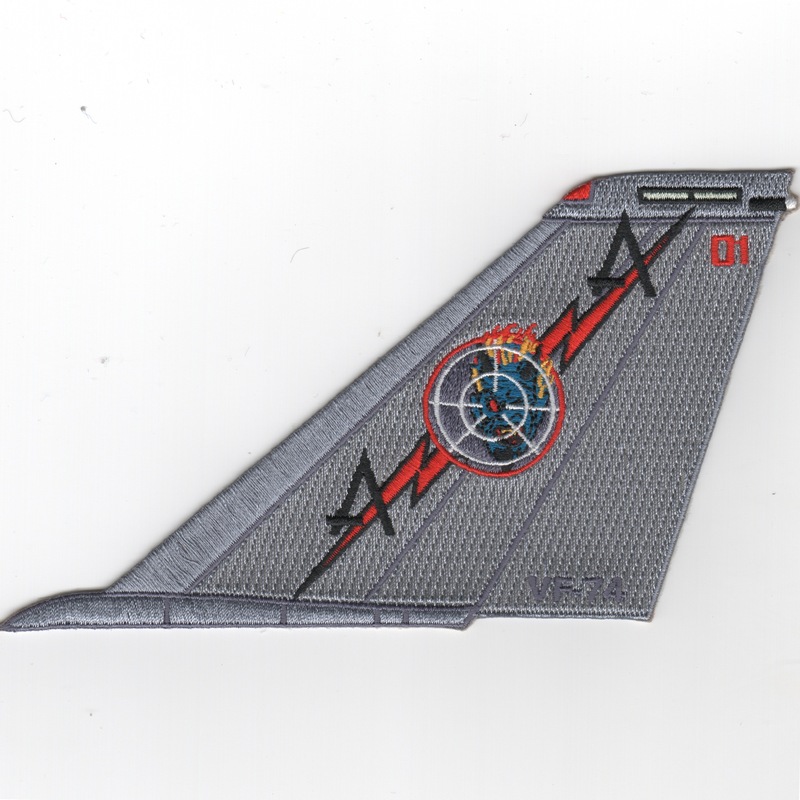 This is the R/W/B diagonal paintscheme for the F-14 Tomcat Tail Fin for VF-2 "Bounty Hunters". This patch does not have the "text box" along the bottom. 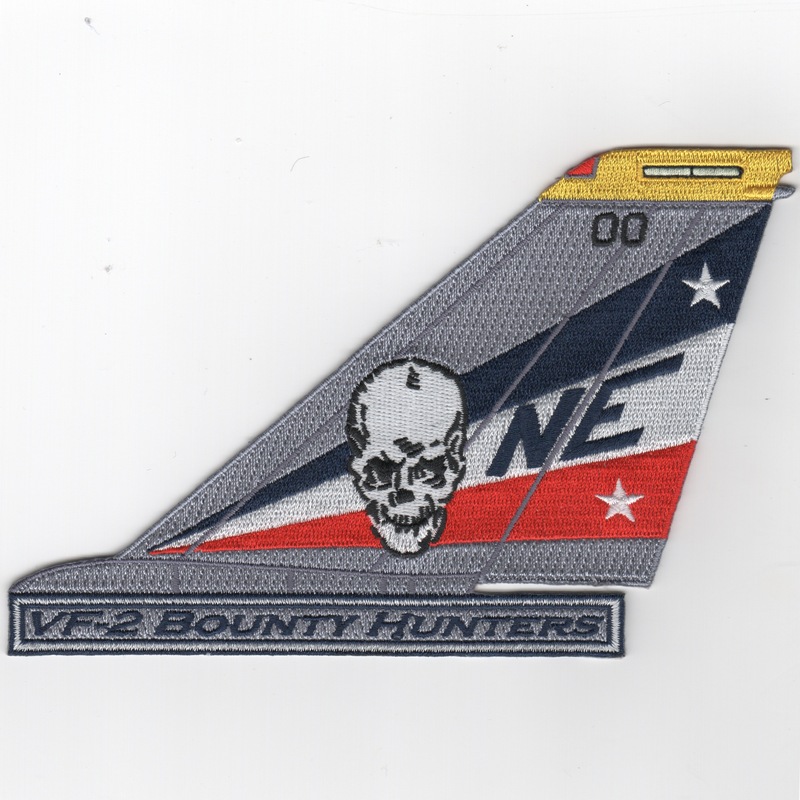 This is the R/W/B diagonal paintscheme for the F-14 Tomcat Tail Fin for VF-2 "Bounty Hunters". This patch does have the "text box" along the bottom. This is the "NK" (with Stars on the Rudder) verions for the F-14 Tomcat Tail Fin for VF-2 "Bounty Hunters". This patch does not have the "text box" along the bottom. 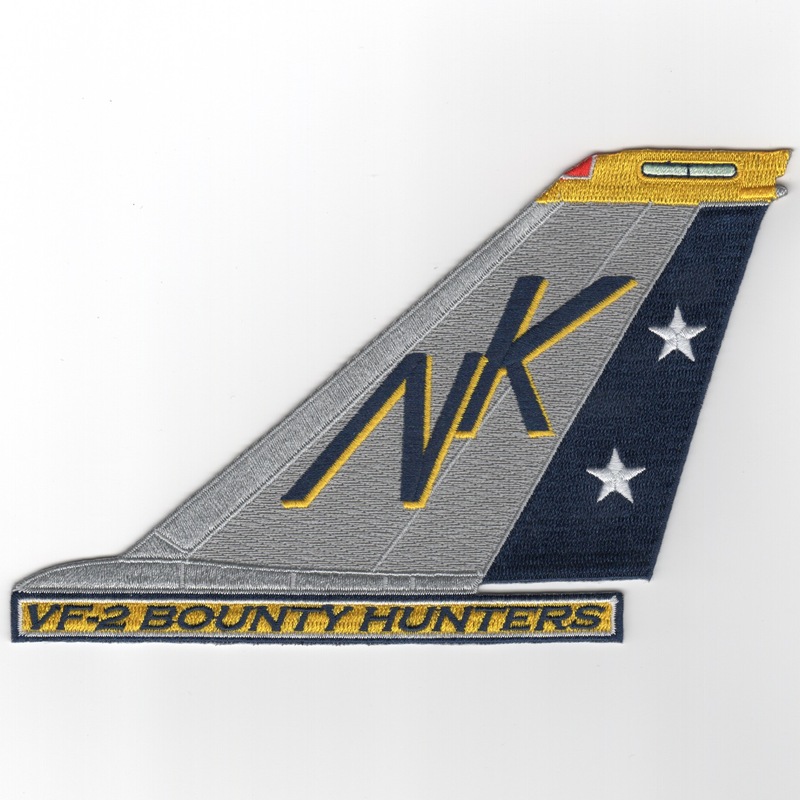 This is the "NK" (with Stars on the Rudder) verions for the F-14 Tomcat Tail Fin for VF-2 "Bounty Hunters". This patch does have the "text box" along the bottom. This is the dark blue paintscheme for the F-14 Tomcat Tail Fin for VF-11 "Red Rippers". This is the gray paintscheme for the F-14 Tomcat Tail Fin for VF-11 "Red Rippers". It features the Rippers shield on it. 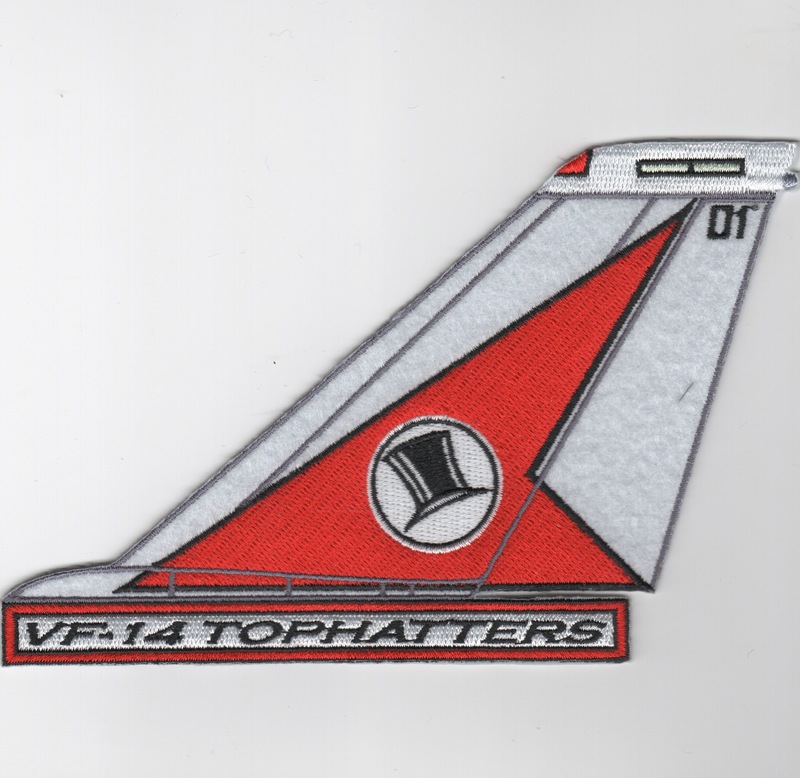 This is the "all-gray" version of the F-14 Tomcat Tail Fin for VF-14 "Tophatters". 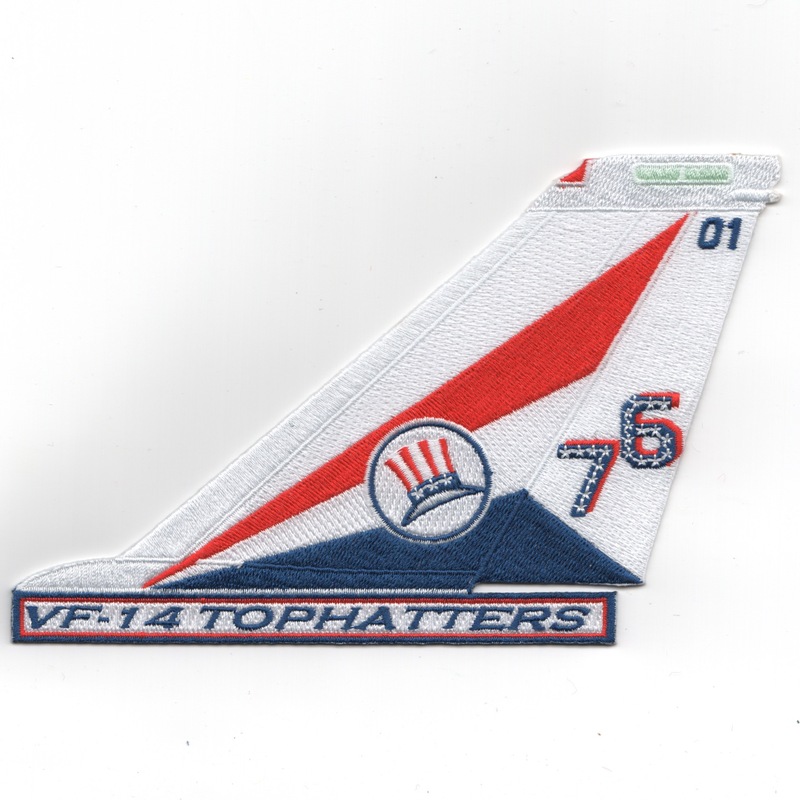 This is the "red-white-blue" BICENTENNIAL version of the F-14 Tomcat Tail Fin for VF-14 "Tophatters". This is the red/white version of the F-14 Tomcat Tail Fin for VF-14 "Tophatters" and does NOT have the text box at the bottom of the patch. 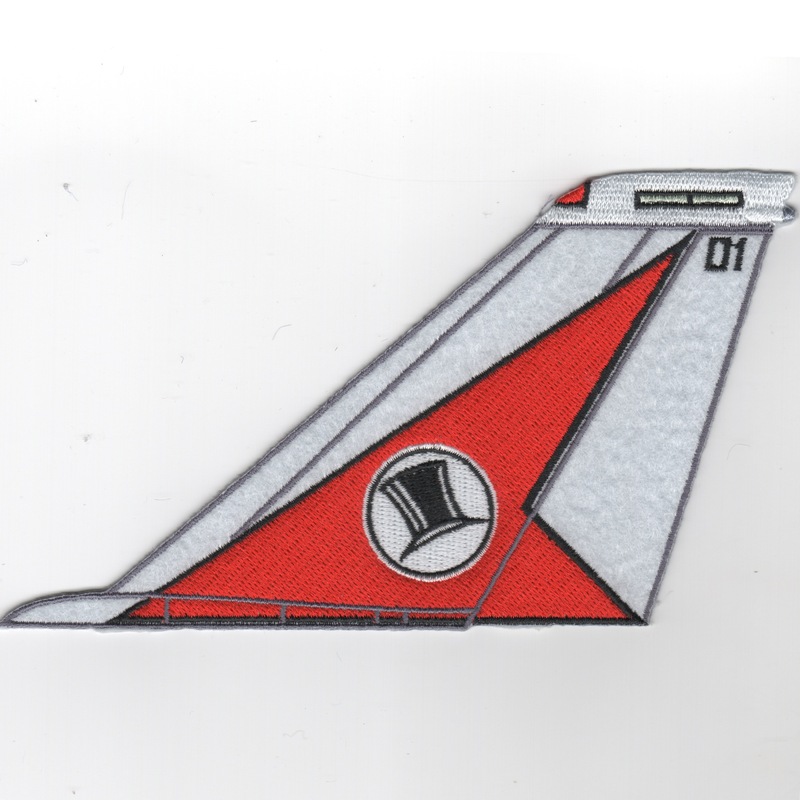 It shows the "Top Hat" on an red backing with a white felt rudder. This patch does not come with velcro attached (none of them do). This is the red/white version of the F-14 Tomcat Tail Fin for VF-14 "Tophatters" and does have the text box at the bottom of the patch. It shows the "Top Hat" on an red backing with a white felt rudder. This patch does not come with velcro attached (none of them do). 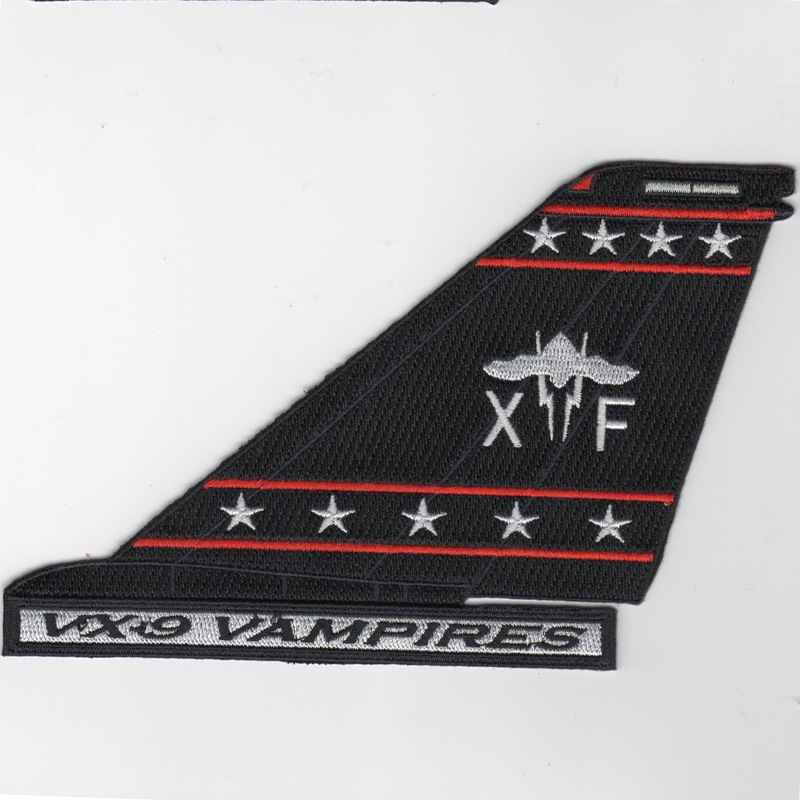 This is the black version of the F-14 Tomcat Tail Fin for VF-14 "Tophatters" and does NOT have the text box at the bottom of the patch. It shows the "Top Hat" on an red backing with a black felt rudder. This patch does not come with velcro attached (none of them do). 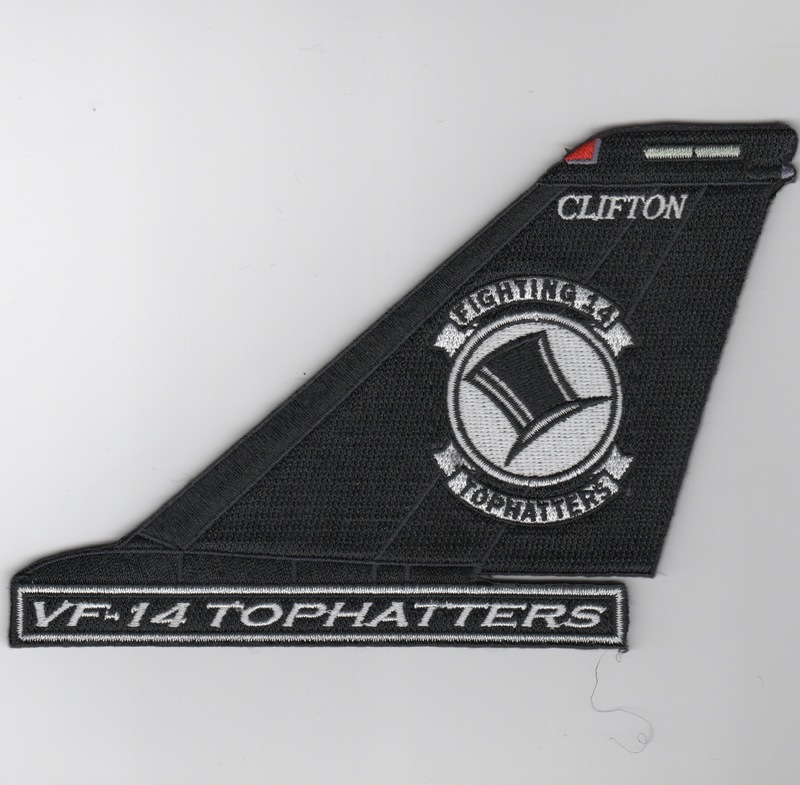 This is the black version of the F-14 Tomcat Tail Fin for VF-14 "Tophatters" and does have the text box at the bottom of the patch. It shows the "Top Hat" on an red backing with a black felt rudder. This patch does not come with velcro attached (none of them do). This is the F-14 Tomcat Tail Fin for VF-21 "Freelancers" without the text. This is the F-14 Tomcat Tail Fin for VF-21 "Freelancers" with the squadron designation listed. This is the F-14 Tomcat Tail Fin for VF-24 "Renegades" without the text. 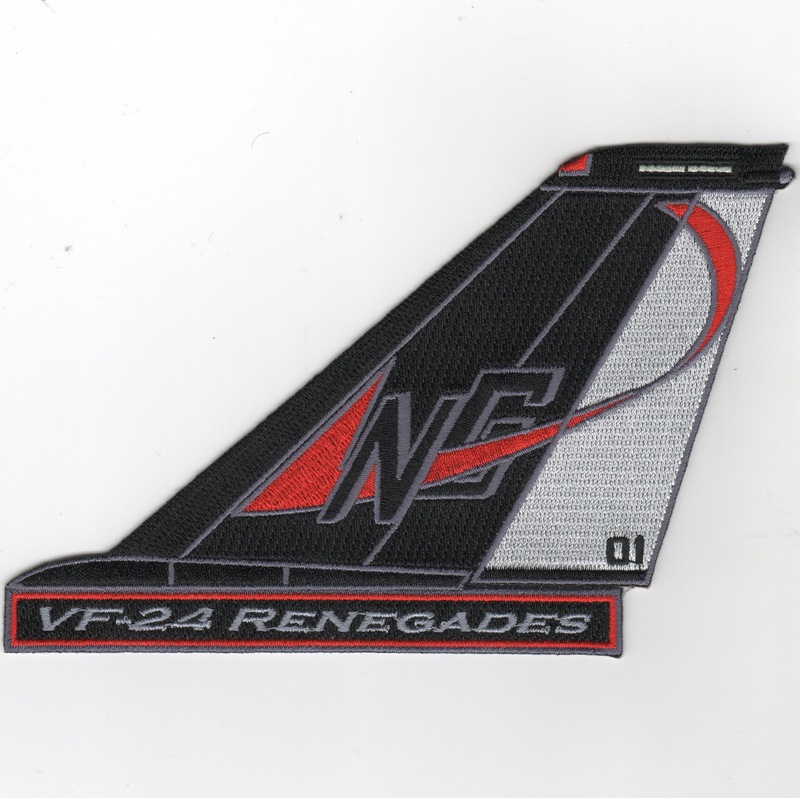 This is the F-14 Tomcat Tail Fin for VF-24 "Renegades" with the squadron designation listed. 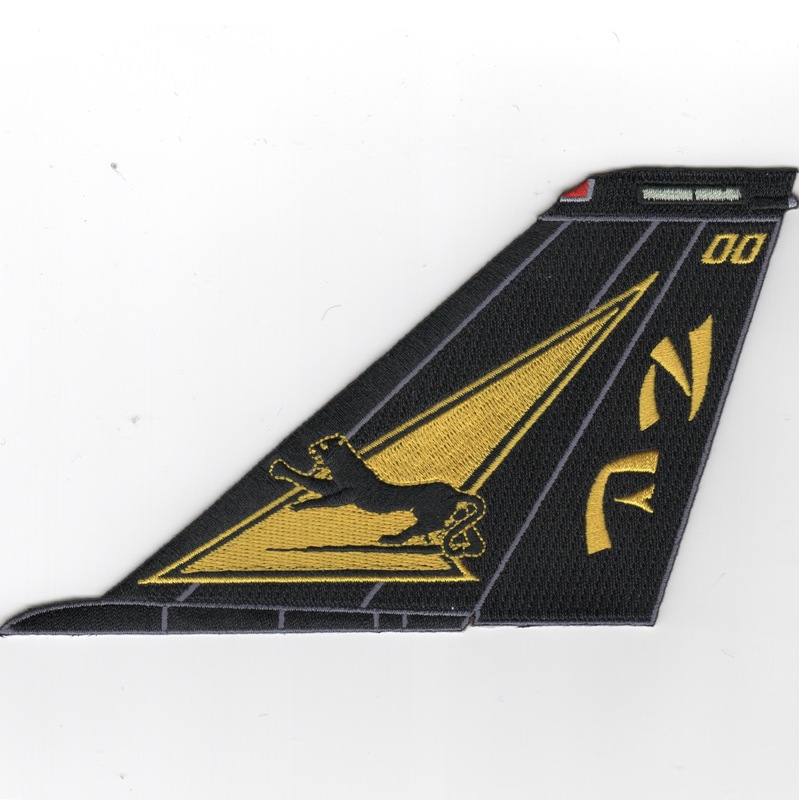 This is the black/yellow paintscheme for the F-14 Tomcat Tail Fin for VF-31 "Tomcatters". This is the red/gray paintscheme for the F-14 Tomcat Tail Fin for VF-31 "Tomcatters". 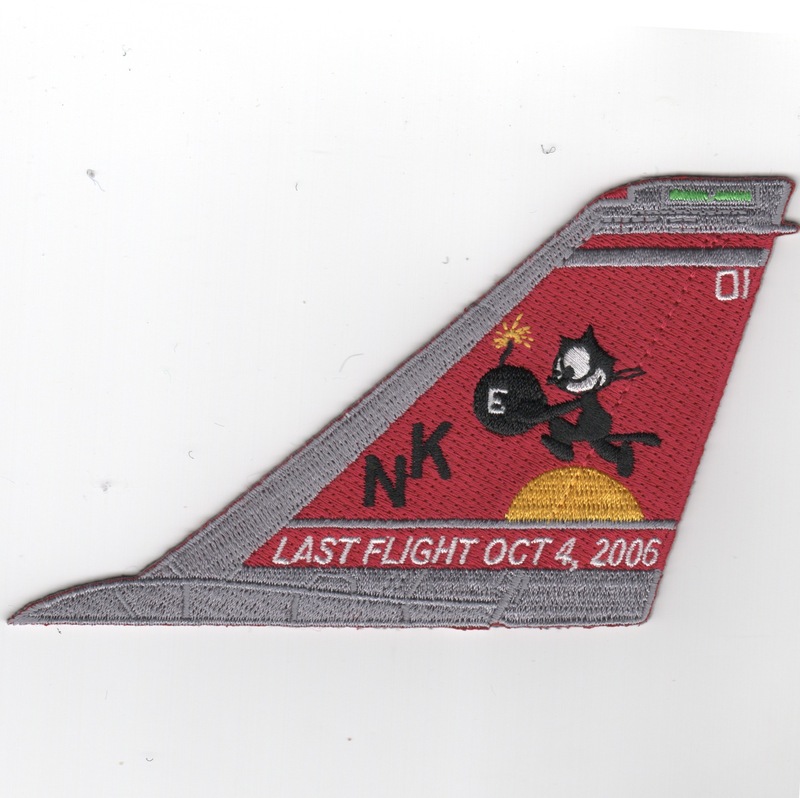 This is the red/gray paintscheme for the F-14 Tomcat Tail Fin for VF-31 "Tomcatters" depicting their "Last Flight" of the Tomcat on 6 October 2006. This one is a little smaller than the rest of the tailfins. This is the dark blue paintscheme for the F-14 Tomcat Tail Fin for VF-32 "Swordsmen". This is the yellow paintscheme for theF-14 Tomcat Tail Fin for VF-32 "Swordsmen". The 'Starfighters' of VF-33 flew the F-14A Tomcat before being decommissioned. Established in October 1948, they were originally known as the 'Tarsiers' until the mid-80s. They transitioned from the F-4 Phantom to the F-14 Tomcat in 1981. They flew in operations against Libya, and Desert Storm onboard the USS America with CVW-1. 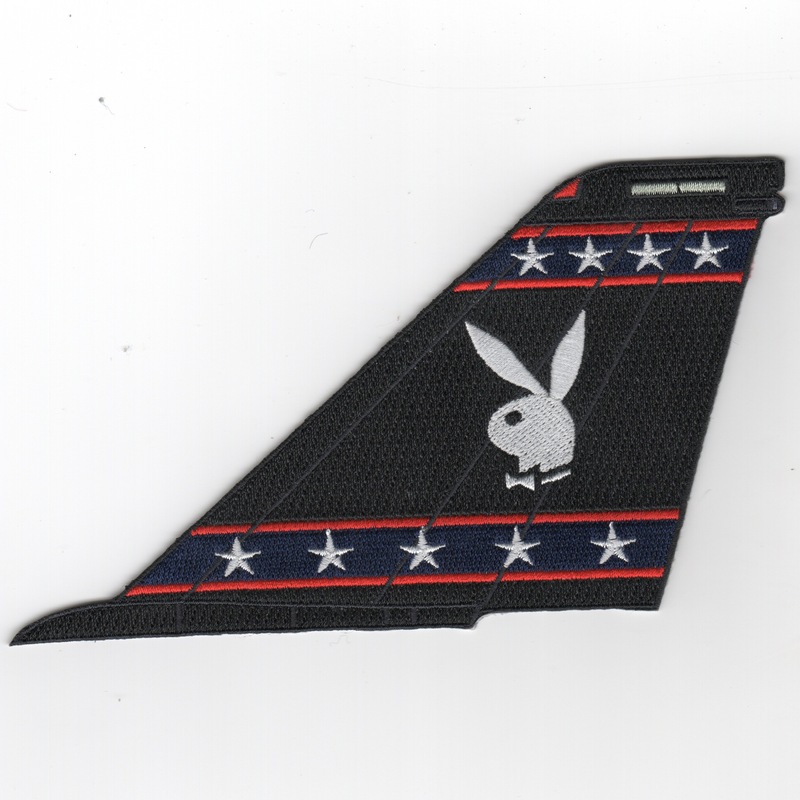 This is their tailfin patch without the text at the bottom and does not come with velcro attached. 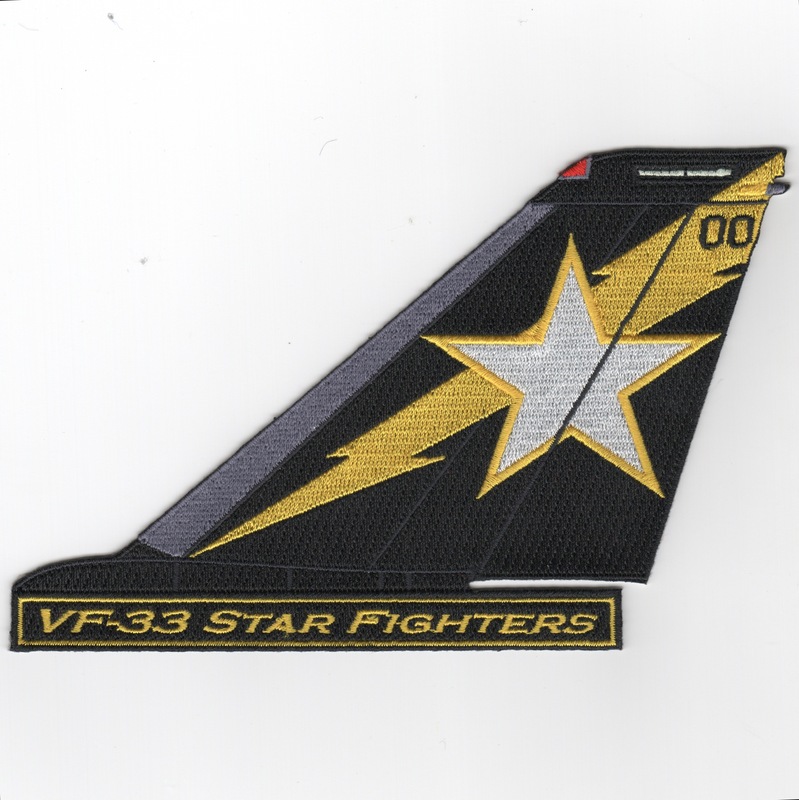 The 'Starfighters' of VF-33 flew the F-14A Tomcat before being decommissioned. Established in October 1948, they were originally known as the 'Tarsiers' until the mid-80s. They transitioned from the F-4 Phantom to the F-14 Tomcat in 1981. They flew in operations against Libya, and Desert Storm onboard the USS America with CVW-1. 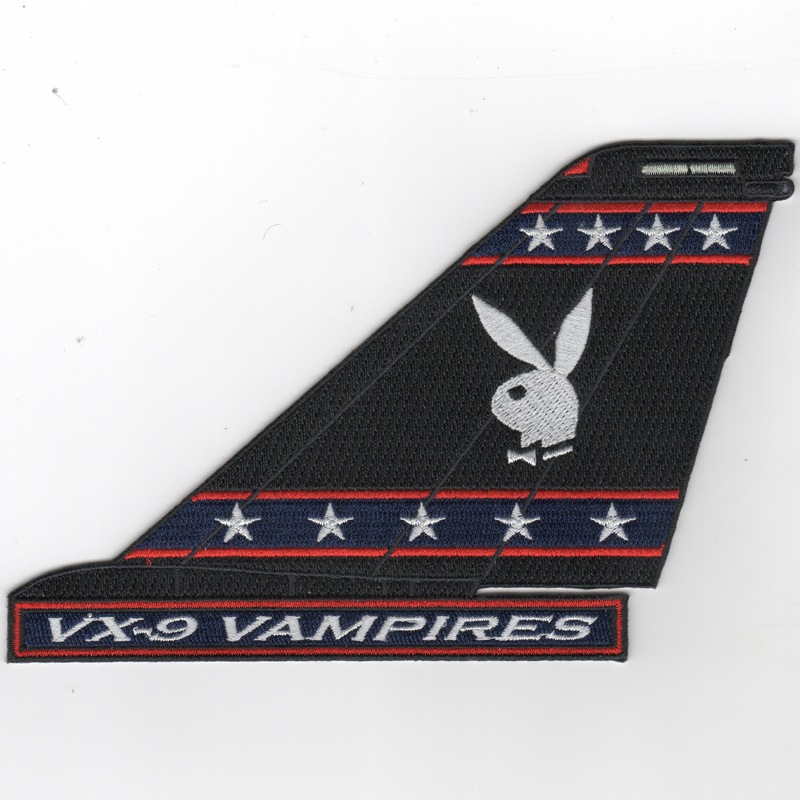 This is their tailfin patch with the text at the bottom and does not come with velcro attached. 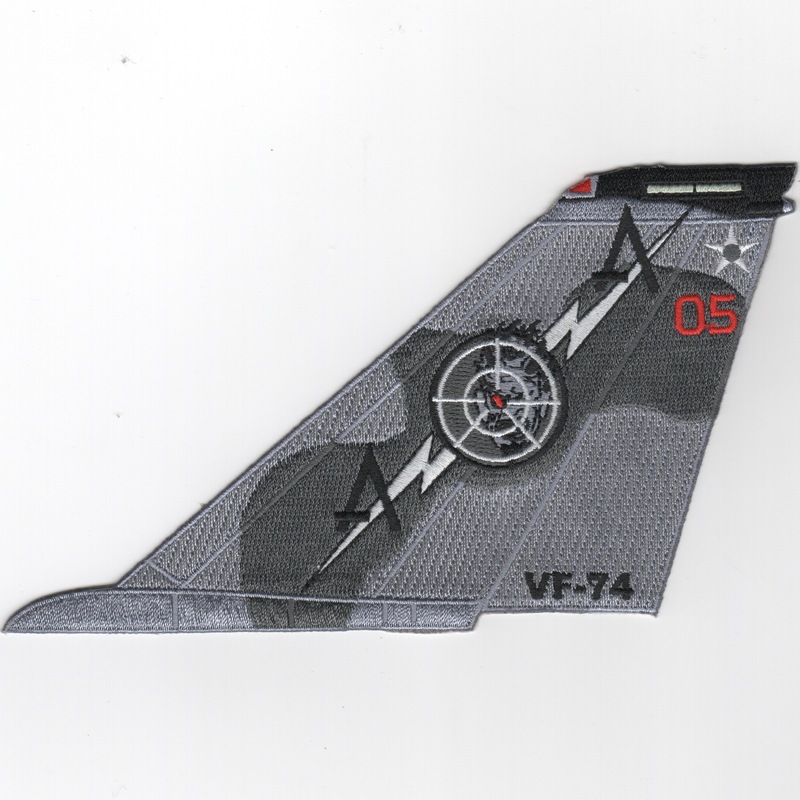 This is the "all gray" version of the F-14 Tomcat Tail Fin for VF-41 "Black Aces". 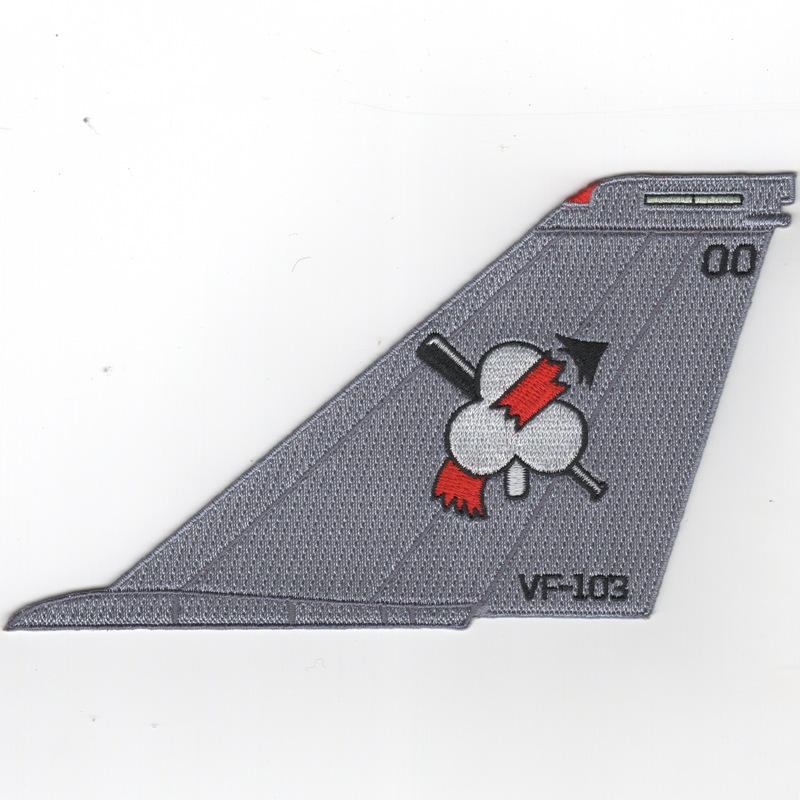 This is the Tailcode 'AJ' red-white version of the F-14 Tomcat Tail Fin for VF-41 "Black Aces". This one does not have text or velcro. 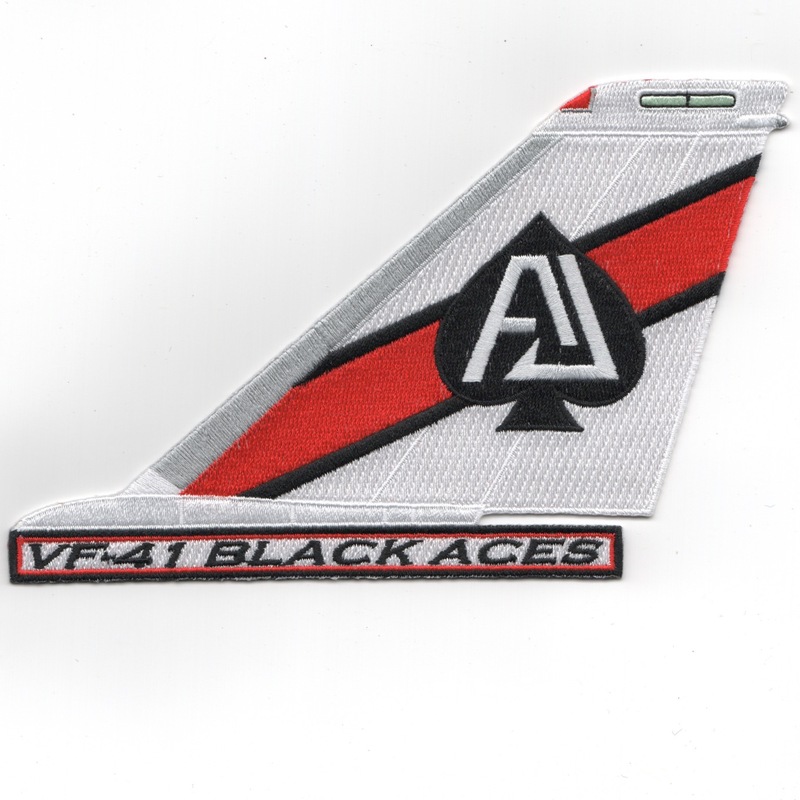 This is the Tailcode 'AJ' red-white version of the F-14 Tomcat Tail Fin for VF-41 "Black Aces". This one does have text, but no velcro. This is the F-14 Tomcat Tail Fin for VF-51 "Screaming Eagles" without the text. This is the F-14 Tomcat Tail Fin for VF-51 "Screaming Eagles" with the squadron designation listed. This is the color version F-14 Tomcat Tail Fin for VF-74 "Be-Devilers" that has the '01 at the top of the vertical tail and does not have text at the bottom of the tail. This version of the tailfin patch has the red lightning bolt and colorful bedeviler. This is the color version F-14 Tomcat Tail Fin for VF-74 "Be-Devilers" that has the '01 at the top of the vertical tail and does have text at the bottom of the tail. This version of the tailfin patch has the red lightning bolt and colorful bedeviler. This is the all-gray version of the F-14 Tomcat Tail Fin for VF-74 "Be-Devilers" that has the '02' at the top of the tail. This is the 'all-gray' version F-14 Tomcat Tail Fin for VF-74 "Be-Devilers" that has the '05 at the top of the vertical tail and does not have text at the bottom of the tail. 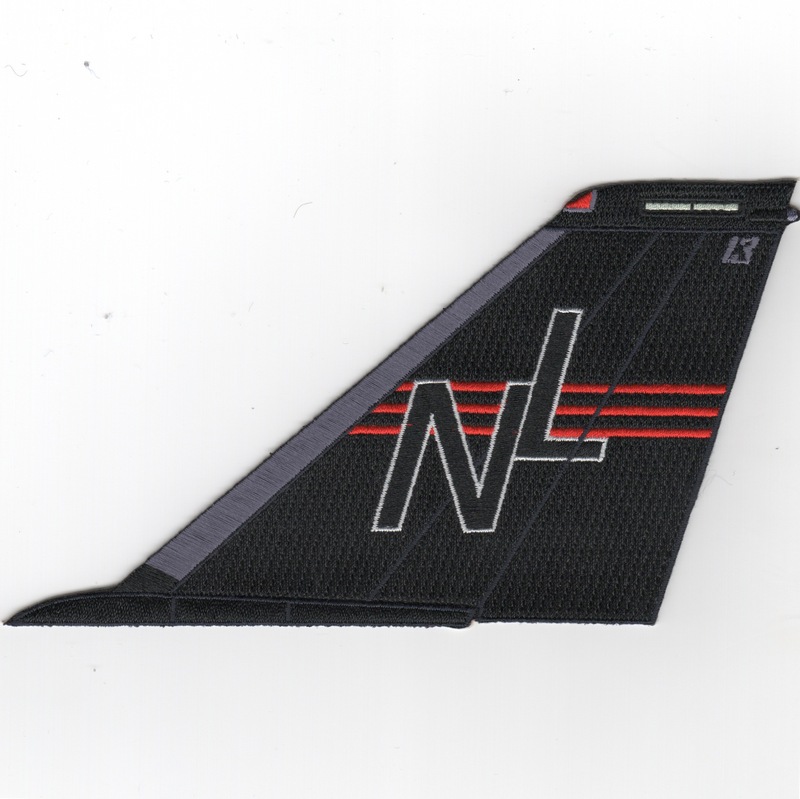 This version of the tailfin patch has the white lightning bolt and 'subdued-gray' bedeviler. 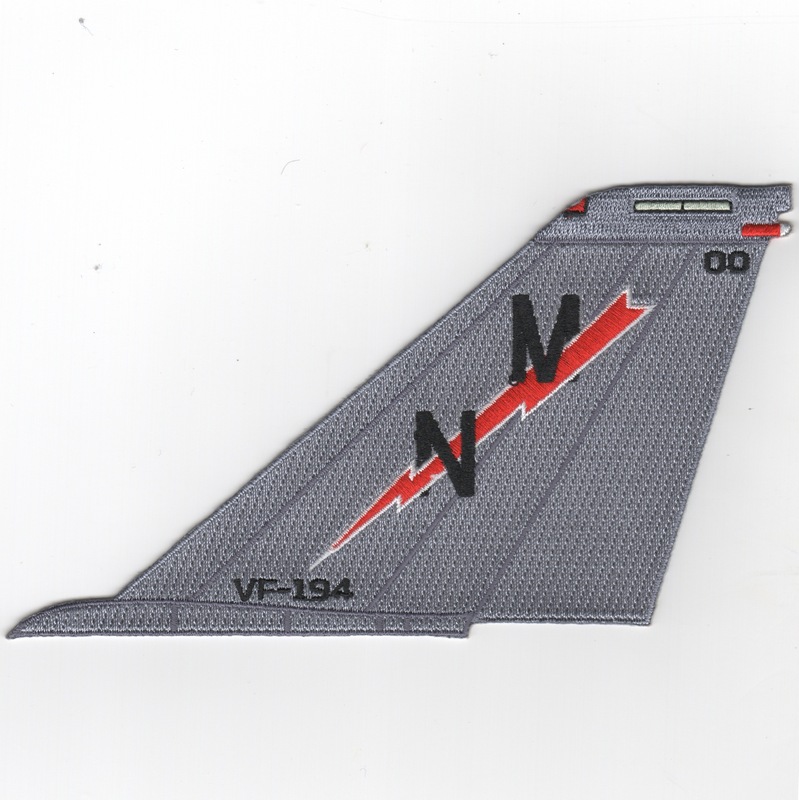 This is the 'all-gray' version F-14 Tomcat Tail Fin for VF-74 "Be-Devilers" that has the '05 at the top of the vertical tail and does have text at the bottom of the tail. 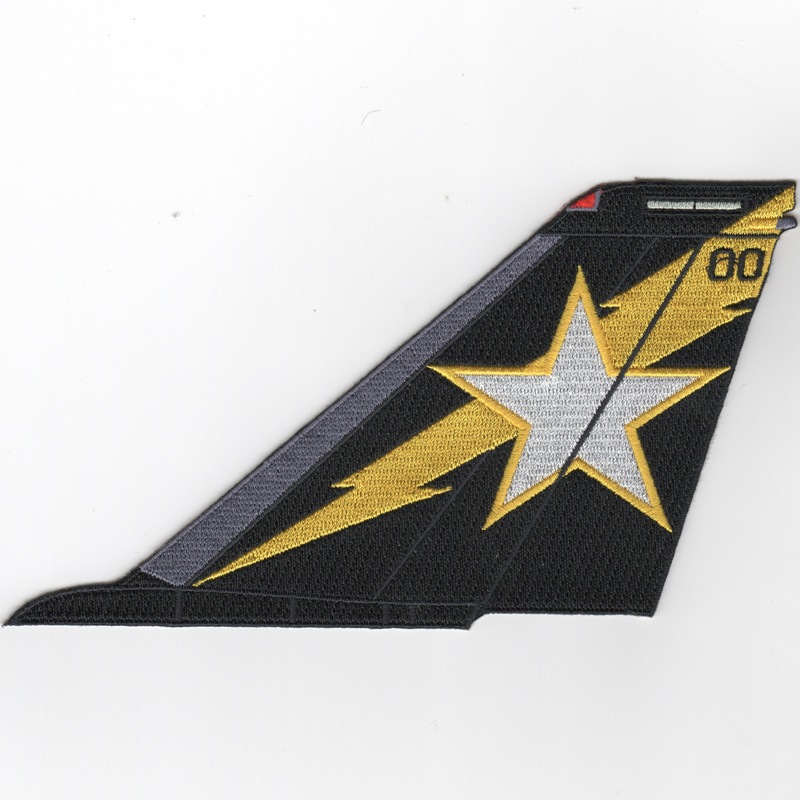 This version of the tailfin patch has the white lightning bolt and 'subdued-gray' bedeviler. This is one of the F-14 Tomcat TailFins for the VF-84 "Jolly Rogers". This version of the tailfin has the lighter gray leading edge of the vertical tail. 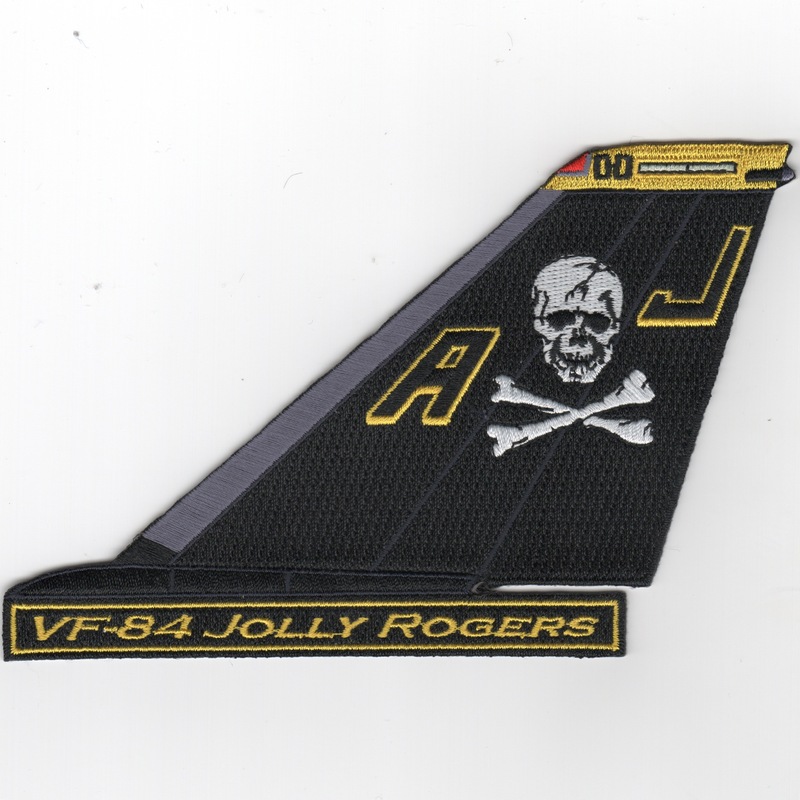 This is the F-14 Tomcat Tail Fin for VF-84 "Jolly Rogers" without the text. 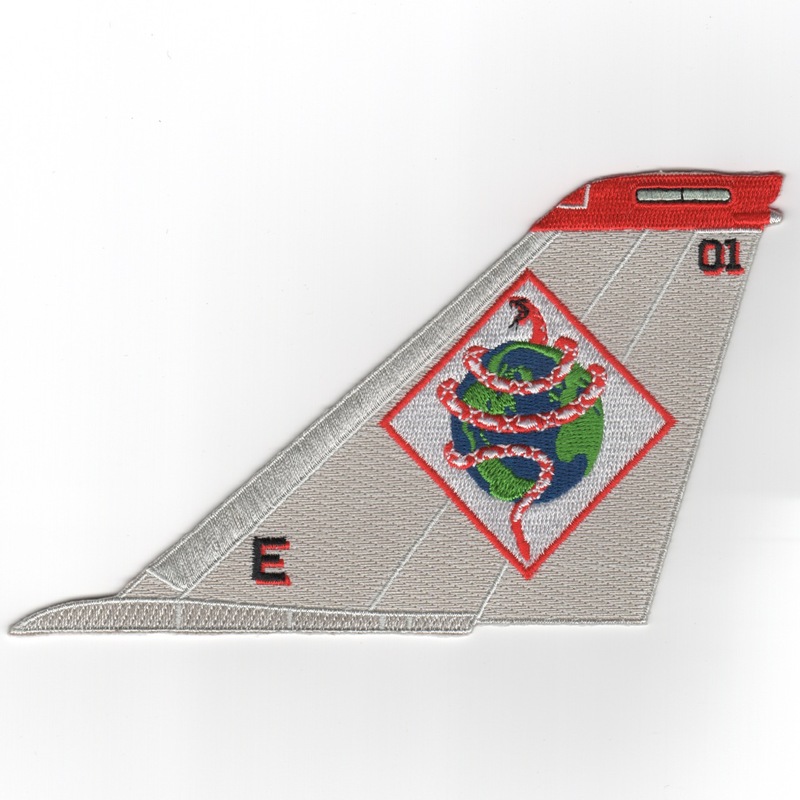 This version of the tailfin patch has the darker leading edge of the vertical tail. This is the gray/red paintscheme for the F-14 Tomcat Tail Fin for VF-101 "Grim Reapers" and has their 'NG' tailcode in big letters. 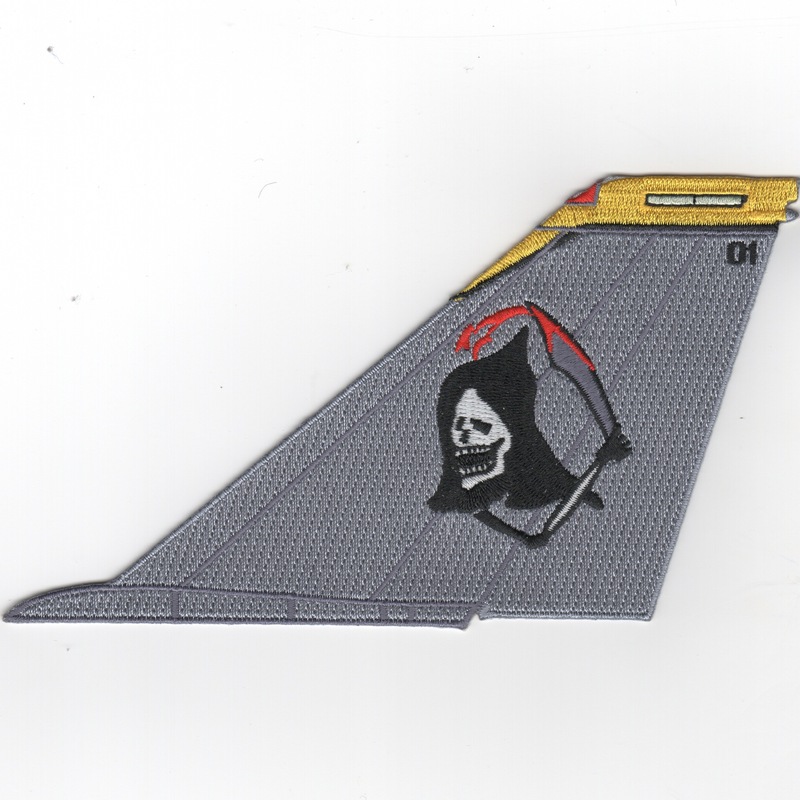 This is the "all-gray" paintscheme for the F-14 Tomcat Tail Fin for VF-101 "Grim Reapers". This version has "Flying Moe" on it. This is the "all-red" paintscheme for the F-14 Tomcat Tail Fin for VF-101 "Grim Reapers". This version has "Flying Moe" on it and does not have TEXT at the bottom. This is the "all-red" paintscheme for the F-14 Tomcat Tail Fin for VF-101 "Grim Reapers". This version has "Flying Moe" on it and does have TEXT at the bottom. This is the "black" paintscheme for the F-14 Tomcat Tail Fin for VF-101 "Grim Reapers". This version has the white "Moe" on it and does not have TEXT at the bottom. This is the "black" paintscheme for the F-14 Tomcat Tail Fin for VF-101 "Grim Reapers". This version has the white "Moe" on it and does have TEXT at the bottom. 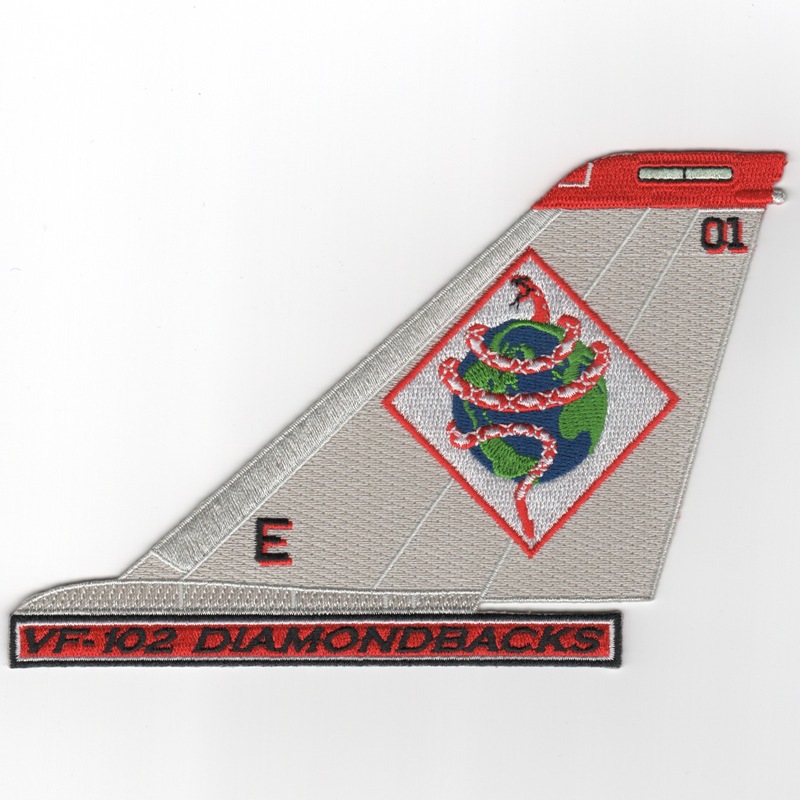 Another AV8RSTUFF Creation: This is one of the F-14 tailfins we created for the VF-102 DIAMONDBACKS. It is the gray version that has their mascot (the snake) wrapped around the world in the 'diamond' box. It does NOT have the text box and the bottom and does not come with velcro attached. 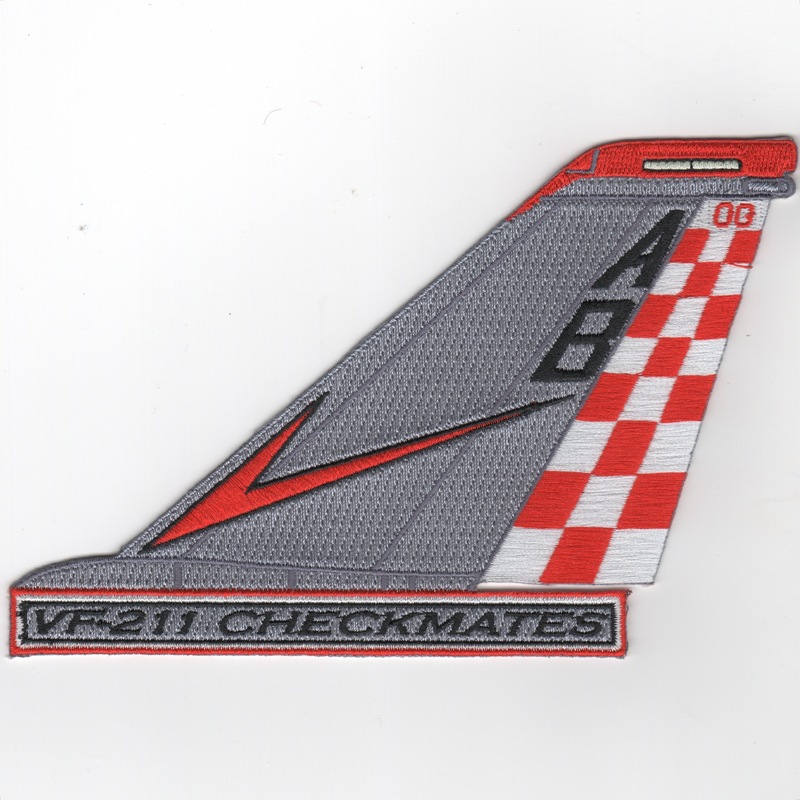 Another AV8RSTUFF Creation: This is one of the F-14 tailfins we created for the VF-102 DIAMONDBACKS. It is the gray version that has their mascot (the snake) wrapped around the world in the 'diamond' box. It DOES have the text box and the bottom and does not come with velcro attached. 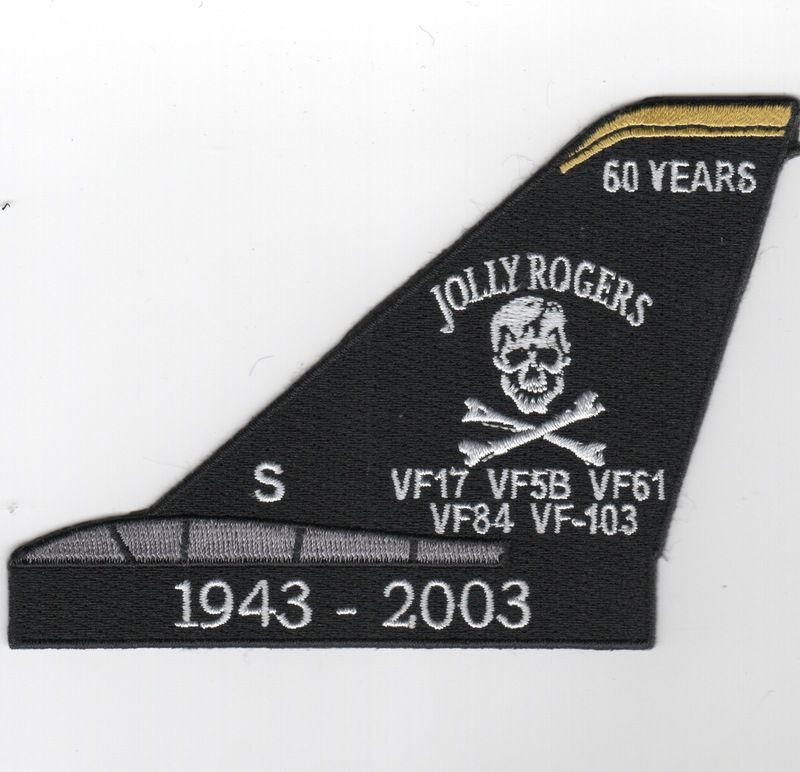 This is the '60-YEAR' Anniversary tailfin created by the Jolly Rogers to commemorate their legacy. It shows their Squadron "Designator" lineage and says "1943 - 2003" along the bottom. This patch does not come with velcro already attached. This is the black paintscheme for the F-14 Tomcat Tail Fin for VF-103 "Jolly Rogers". 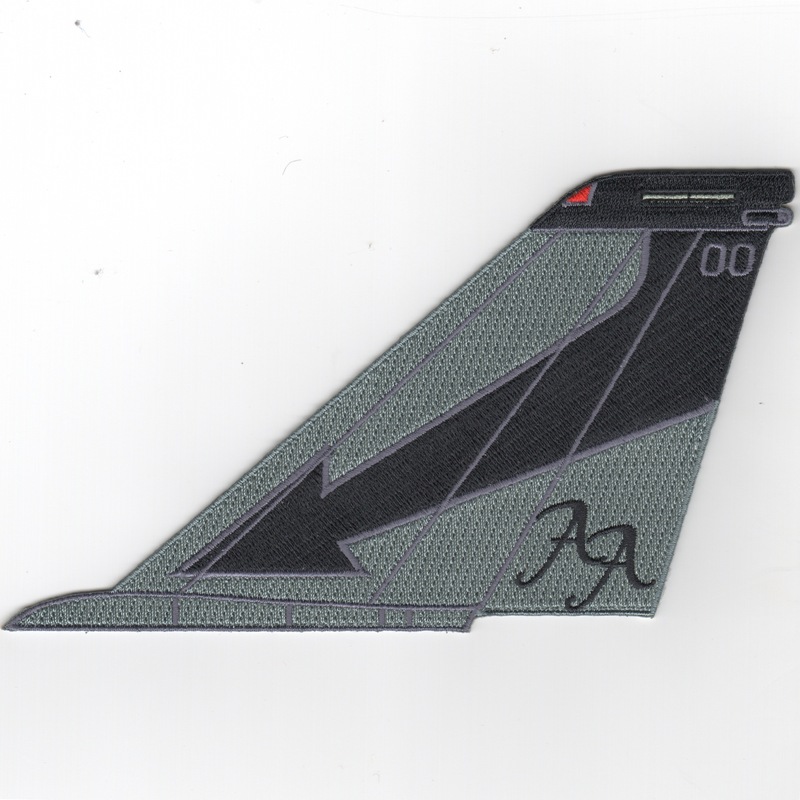 This is the 'Dark Gray' version of the Sluggers tailfin without any squadron desgination along the bottom. This patch does not come with velcro already attached. This is the 'Dark Gray' version of the Sluggers tailfin with the squadron desgination along the bottom. This patch does not come with velcro already attached. This is the 'Light Gray' version of the Sluggers tailfin without any squadron desgination along the bottom. This patch does not come with velcro already attached. This is the 'Light Gray' version of the Sluggers tailfin with the squadron desgination along the bottom. This patch does not come with velcro already attached. This is the black version of the Jolly Rogers F-14 Tailfin. It has an "all-gray" skull emblazoned on the tail without any text at the bottom. This is the black version of the Jolly Rogers F-14 Tailfin. It has an "all-gray" skull emblazoned on the tail with text at the bottom. This is the black version of the Jolly Rogers F-14 Tailfin that has an "all-white" skull emblazoned on the tail with a white tip on top of the tail, without any text at the bottom. This is the black version of the Jolly Rogers F-14 Tailfin that has an "all-white" skull emblazoned on the tail with a white tip on top of the tail, with text at the bottom. This is the black version of the Jolly Rogers F-14 Tailfin that has an "all-white" skull emblazoned on the tail with a yellow tip on top of the tail, without any text at the bottom. This is the black version of the Jolly Rogers F-14 Tailfin that has an "all-white" skull emblazoned on the tail with a yellow tip on top of the tail, with text at the bottom. This is the 'black/no text at bottom' version of the Christmas tailfin created for the 'Jolly Rogers' for their cruise in 1996 onboard the USS Enterprise. It has since been used for other cruises also, but that was their first time. This patch does not come with velcro already attached. This is the 'black/text at bottom' version of the Christmas tailfin created for the 'Jolly Rogers' for their cruise in 1996 onboard the USS Enterprise. It has since been used for other cruises also, but that was their first time. This patch does not come with velcro already attached. This is the 'Red/White Setting Sun' version of the Sundowners tailfin without any squadron desgination along the bottom. This patch does not come with velcro already attached. 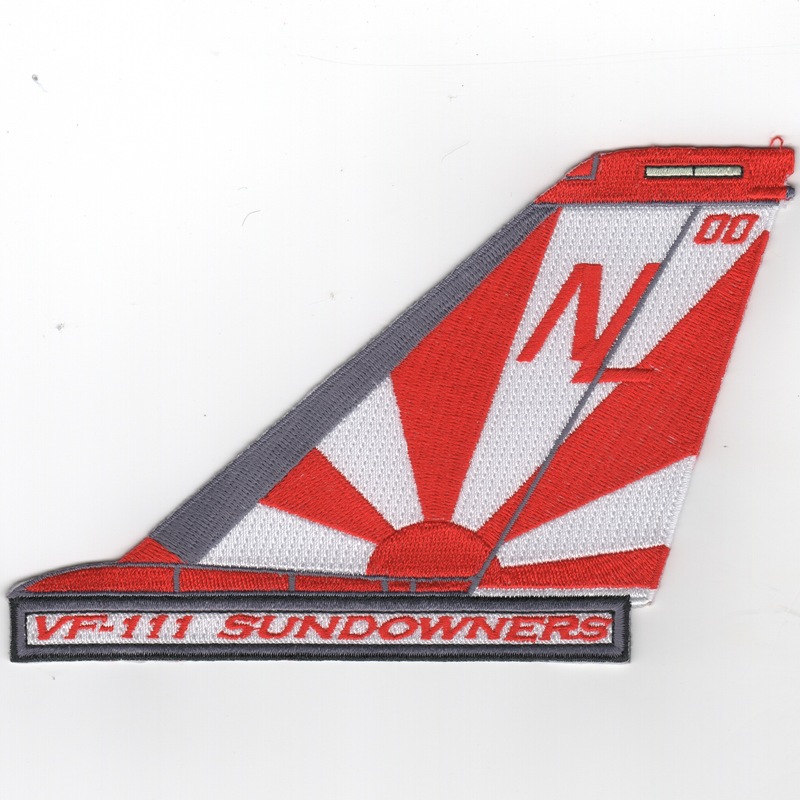 This is the 'Red/White Setting Sun' version of the Sundowners tailfin with the squadron desgination along the bottom. This patch does not come with velcro already attached. This is the 'Yellow/White' version of the Ghostriders tailfin without any squadron desgination along the bottom. This patch does not come with velcro already attached. 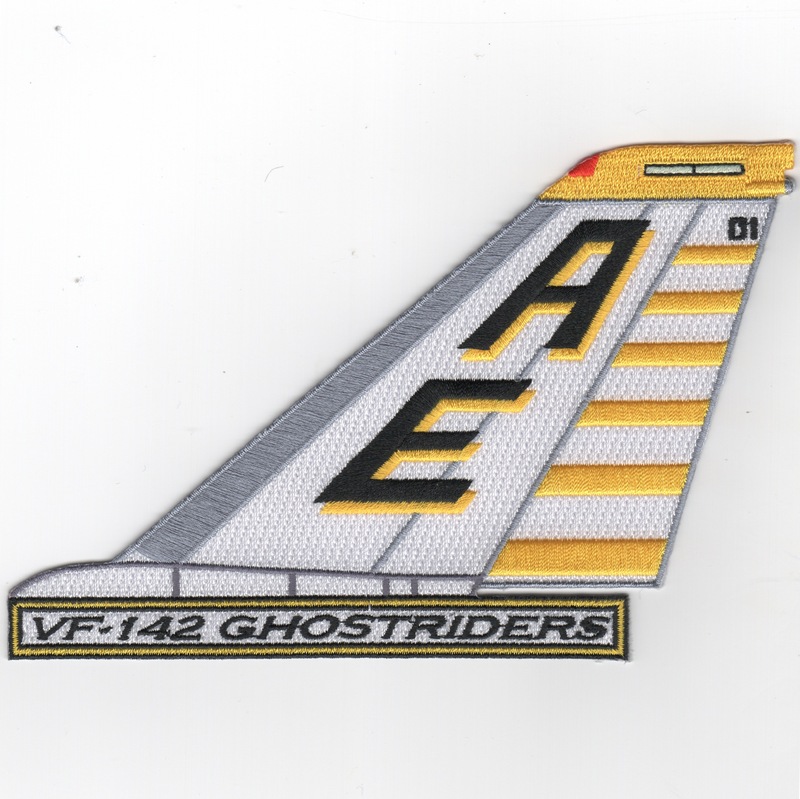 This is the 'Yellow/White' version of the Ghostriders tailfin with the squadron desgination along the bottom. This patch does not come with velcro already attached. This is the 'Dark Gray Grim Reaper' version of the Ghostriders tailfin without any squadron desgination along the bottom. This patch does not come with velcro already attached. This is the 'Dark Gray Grim Reaper' version of the Ghostriders tailfin with the squadron desgination along the bottom. This patch does not come with velcro already attached. This is the F-14 Tomcat Tail Fin for VF-143 "Pukin' Dogs". This is the red & gray striped paintscheme for the F-14 Tomcat Tail Fin for VF-154 "Black Knights". This is the red & black striped paintscheme for the F-14 Tomcat Tail Fin for VF-154 "Black Knights". 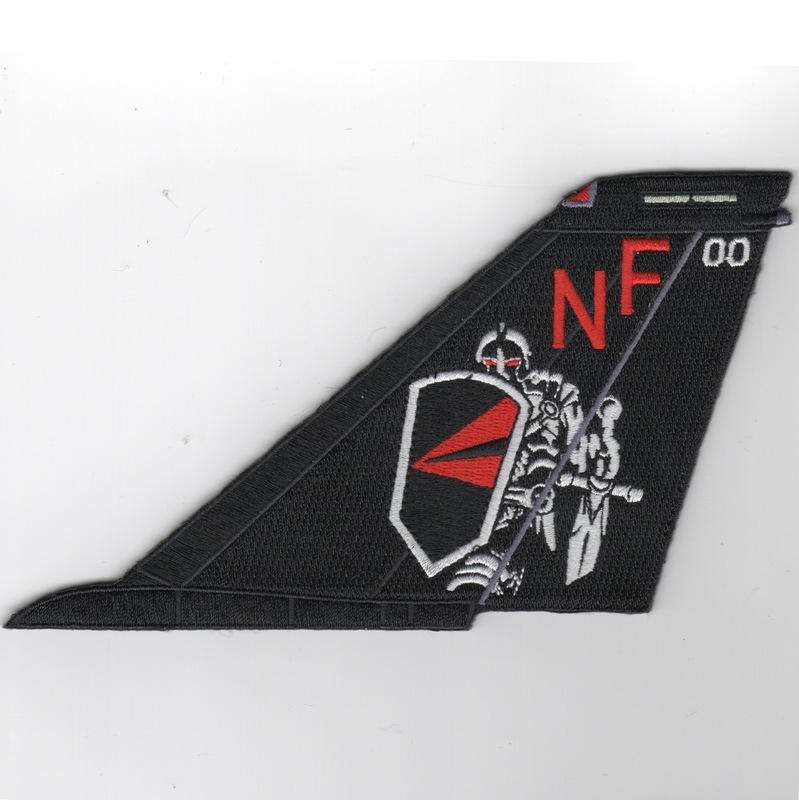 This is the black version of the F-14 Tomcat Tailfin showing their mascot, the Knight, on a field of all black with the red lettering of their airwing "NF" emblazoned across the top. This patch does NOT have the text box along the bottom and does not come with velcro already attached. 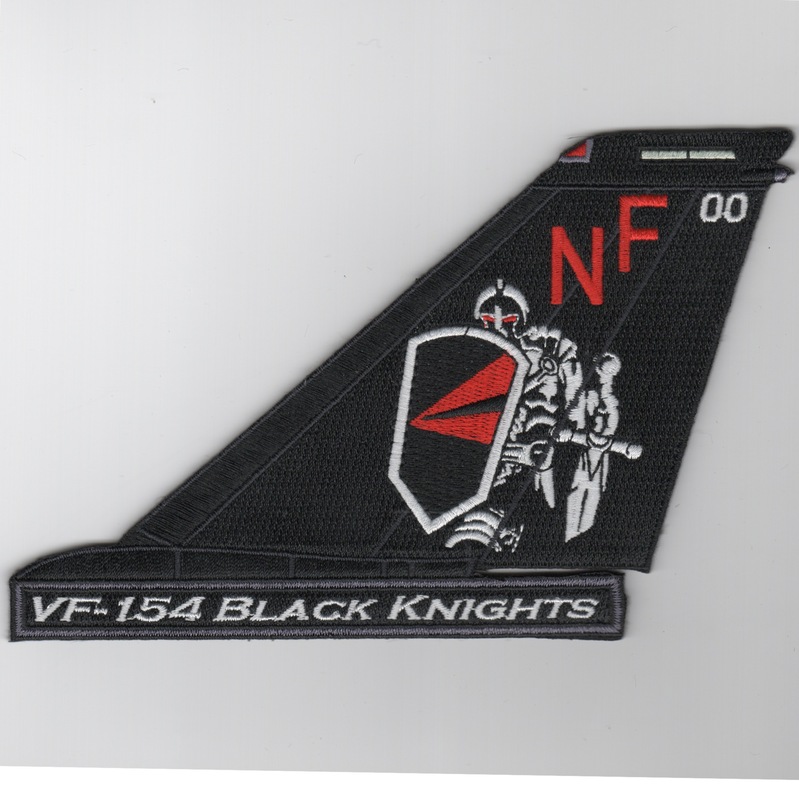 This is the black version of the F-14 Tomcat Tailfin showing their mascot, the Knight, on a field of all black with the red lettering of their airwing "NF" emblazoned across the top. This patch does have the text box along the bottom and does not come with velcro already attached. This is the 'Red Diamond' version of the "Satan's Kittens" tailfin without any squadron desgination along the bottom. This patch does not come with velcro already attached. This is the 'Red Diamond' version of the "Satan's Kittens" tailfin with the squadron desgination along the bottom. This patch does not come with velcro already attached. This is the 'Red Lightning' version of the "Red Lightning" tailfin without any squadron desgination along the bottom. This patch does not come with velcro already attached. 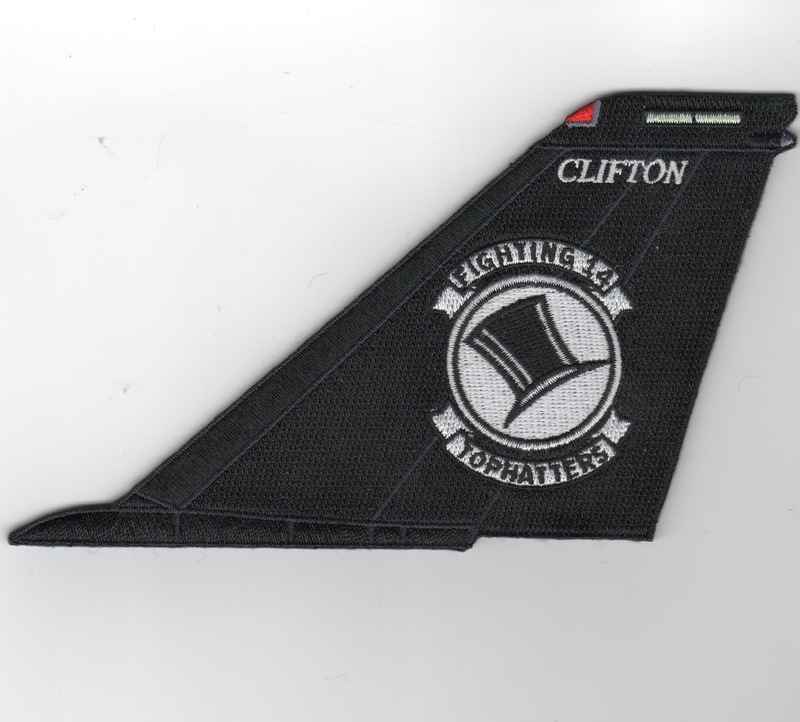 This is the 'Red Lightning' version of the "Red Lightning" tailfin with the squadron desgination along the bottom. This patch does not come with velcro already attached. This is the 'Red Chevron' version of the "Checkmates" tailfin without any squadron desgination along the bottom. This patch does not come with velcro already attached. 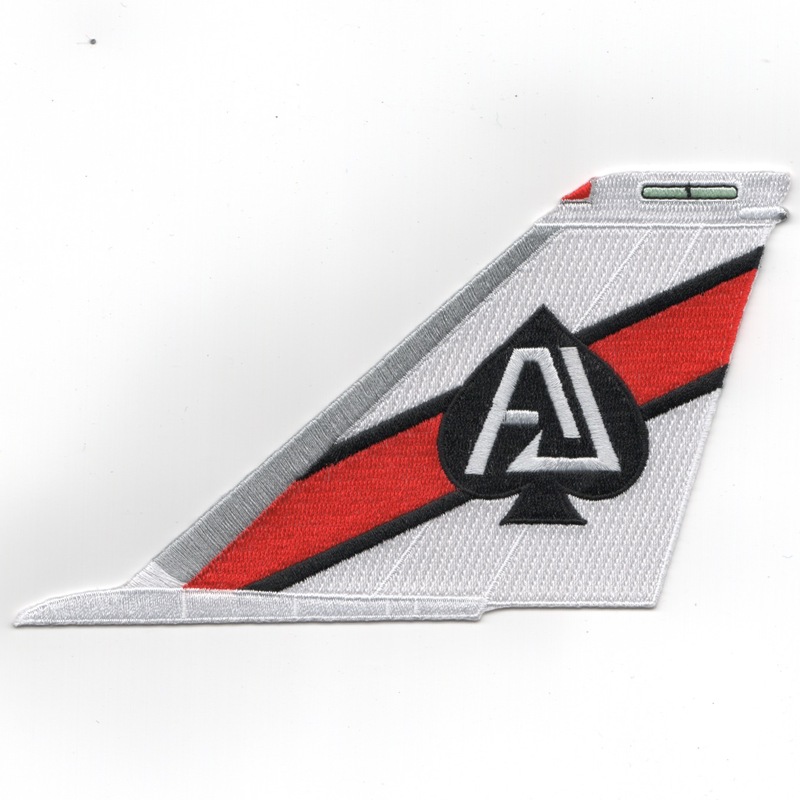 This is the 'Red Chevron' version of the "Checkmates" tailfin with the squadron desgination along the bottom. This patch does not come with velcro already attached. This is the 'Brutus the Mascot' version of the "Checkmates" tailfin without any squadron desgination along the bottom. This patch does not come with velcro already attached. 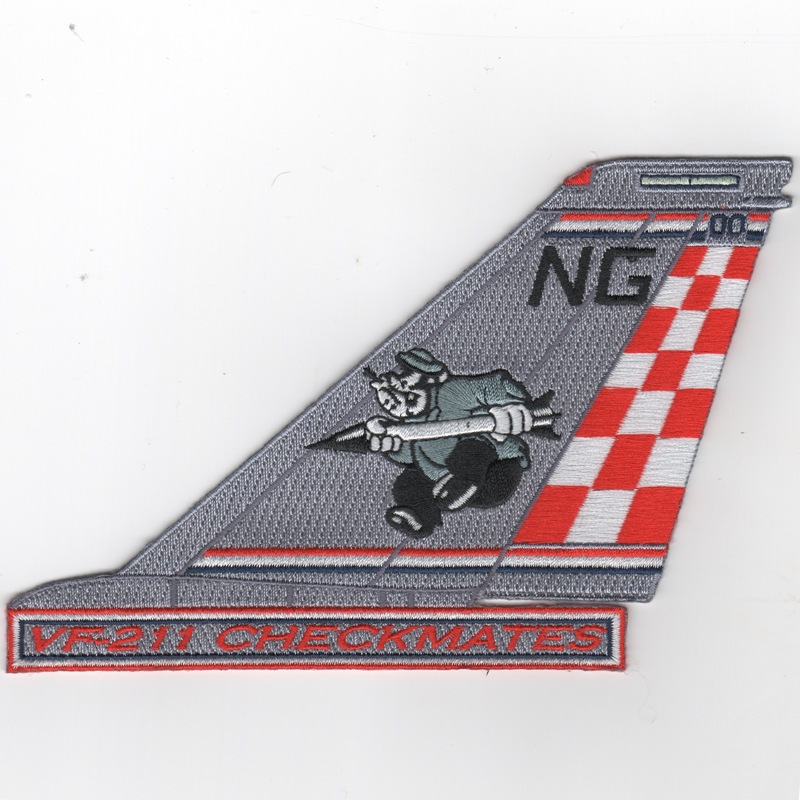 This is the 'Brutus the Mascot' version of the "Checkmates" tailfin with the squadron desgination along the bottom. This patch does not come with velcro already attached. This is the F-14 Tomcat Tail Fin for VF-213 "Blacklions". 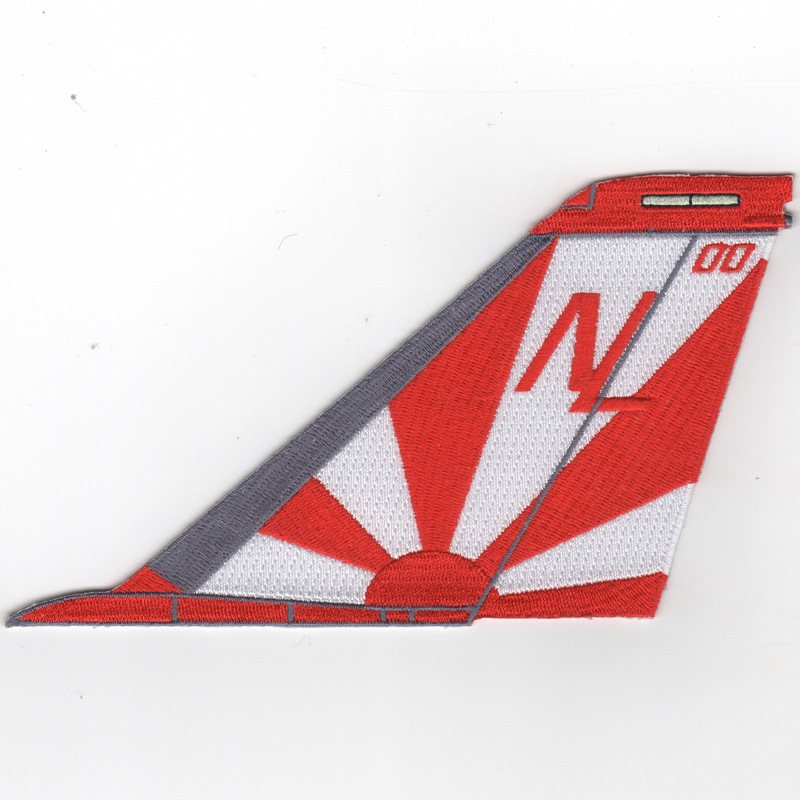 This is the 'Orange Arrow' version of the Devils Disciples tailfin without any squadron desgination along the bottom. This patch does not come with velcro already attached. This is the 'Orange Arrow' version of the Devils Disciples tailfin with the squadron desgination along the bottom. This patch does not come with velcro already attached. 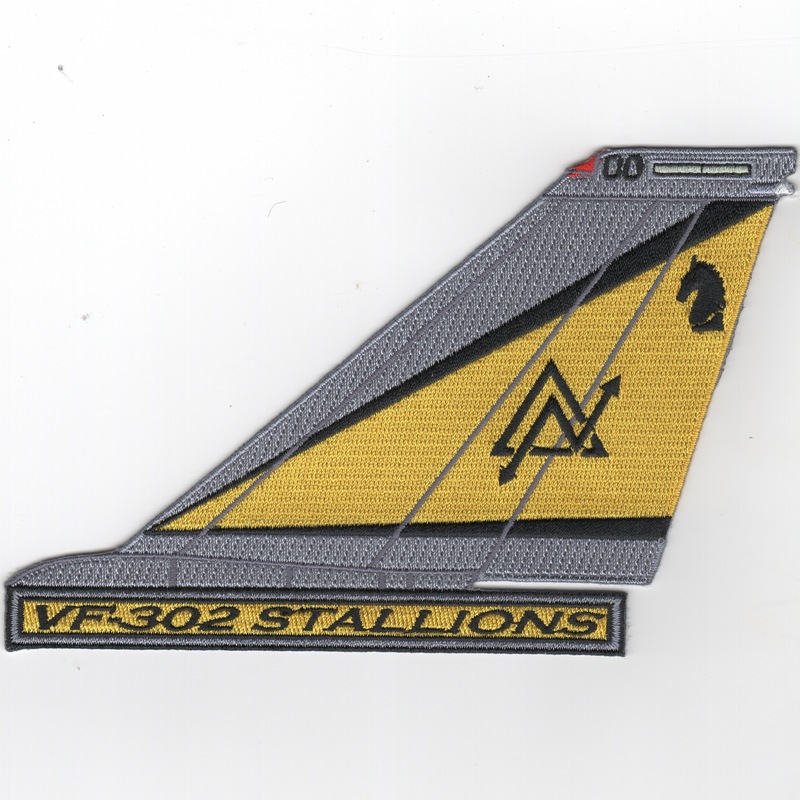 This is the gray/yellow version of the Stallions tailfin without any squadron desgination along the bottom. This patch does not come with velcro already attached. 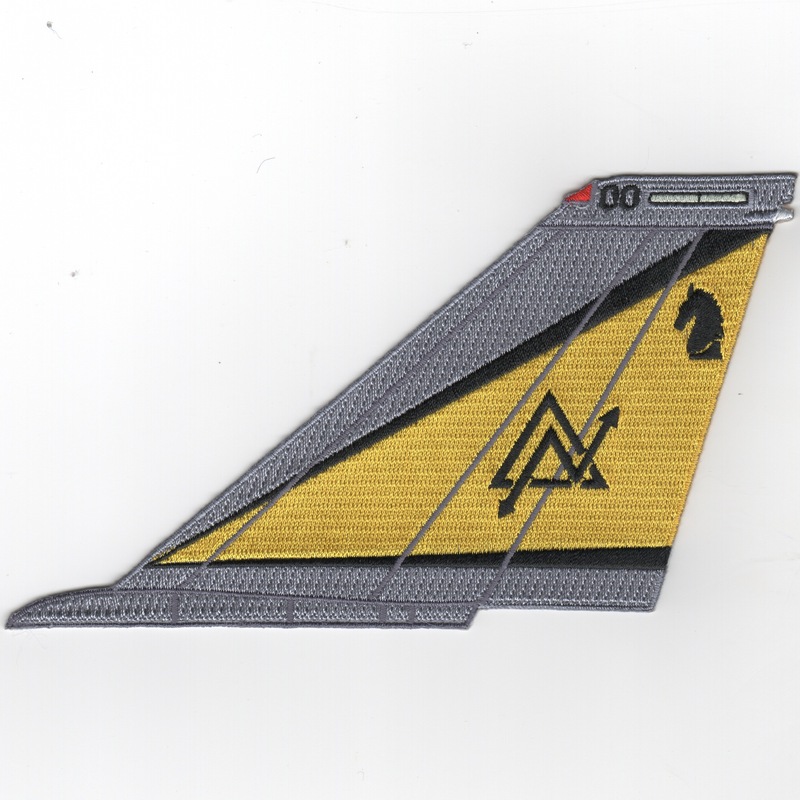 This is the gray/yellow version of the Stallions tailfin with the squadron desgination along the bottom. This patch does not come with velcro already attached. Use this one to order all 34 of the F-14 Tomcat Tailfins that have the "TEXT BOX" below each fin. You will save over 10%!! Use this one to order all 56 of the F-14 Tomcat Tailfins that DO NOT have the "TEXT BOX" below each fin. You will save over 10%!! Use this one to order all 90 of the F-14 Tomcat Tailfins. You will save over 10%!! 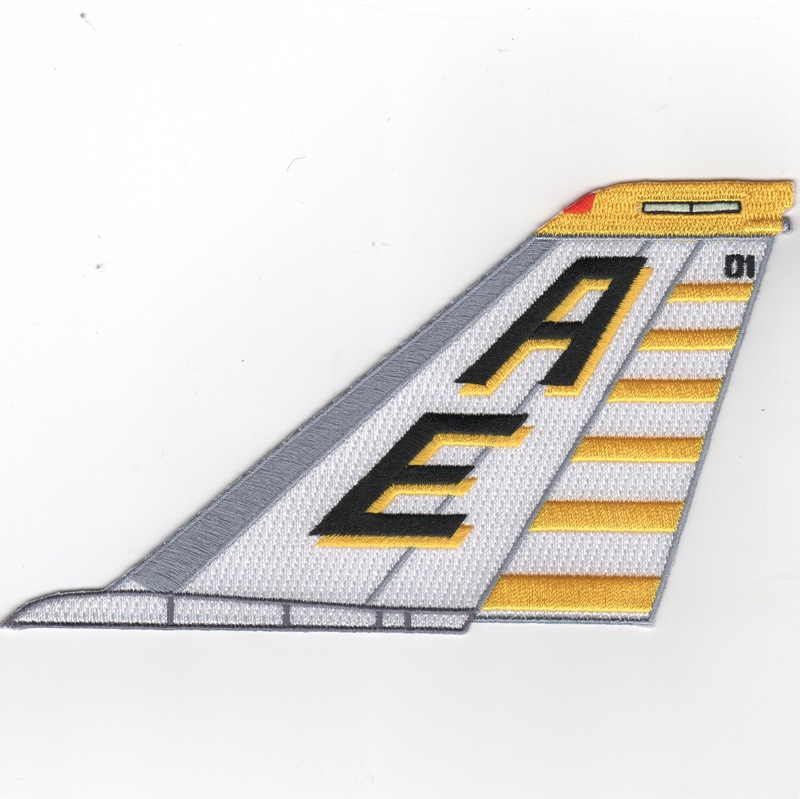 Homepage | Order F-14 Tail Fin Patches!